Mayoka village is surrounded by beautiful mountains and a big river that flows around the village. It’s hot and dry and area farmers are working their farms, preparing for the next short rainy season. Approaching Maria and Lawrence’s farm, a cool breeze blows through the green and lush vegetation. Maria (50) and Lawrence (55) are married and have five children, three boys and two girls. They are farmers and raise livestock as their main source of income. Four of their children go to school and one is working in Arusha town. Maria and Lawrence’s greatest achievement is their love towards each other and their children. “Our parents gave us love and taught us to love each other regardless, which is the greatest gift of all,” says Lawrence looking at his wife Maria who nods her head. Maria shows her water tap and says, “This is a dream come true. A dream of every woman in this village is to have safe and clean water in their compound.” She explains how she used to wake at 5 in the morning and walk for two hours to the river to collect dirty water that made the children sick. The children were weak because of a poor diet of mostly porridge, or “ugali” with pigeon peas which they used to farm on their three acres. “The food from our farm could not take us through the year since we sold most of it to be able to buy school supplies for our children,” says Maria. Maria met World Vision through her savings group and she was exposed to several trainings including best farming practices, poultry, market linkage and financial literacy. World Vision established a demonstration farm in the village for practical learning. World Vision also took Maria and other farmers to Yatta, Kenya to learn from other communities. It was after the trip to Yatta that Maria started engaging her husband Lawrence in the World Vision trainings. “It was easy to tell my husband to change from farming pigeon peas to bananas.” Maria and Lawrence received twenty banana seedlings from World Vision and even though it was a new crop in the area, they were willing to give it a try. 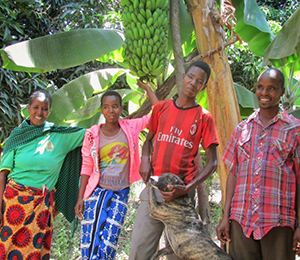 With support from World Vision, the couple has increased their banana plantation to six hundred banana stems, which has boosted their income as well as provided food for the family. Their children are healthy, happy and have dreams for the future. “I want to be a pediatrician when I grow up so I can help malnourished children,” says Adelaide who is Maria and Lawrence third born. Maria and Lawrence can now pay school fees and provide school supplies for their children. Maria is proud to have sent Peter, their second born to vocational training. Peter is now working at a tourism company and helping his parents to expand their farm. Lawrence loves working with his wife on their farm, “I love spending time with my wife on the farm, I learn a lot from her and am sure our children are learning a lot from us as parents. This is where we cultivate our dreams,” says Lawrence with a smile, looking at his wife who smiles back shyly.